Any neutral at the New York Stadium would have enjoyed this entertaining game this afternoon. 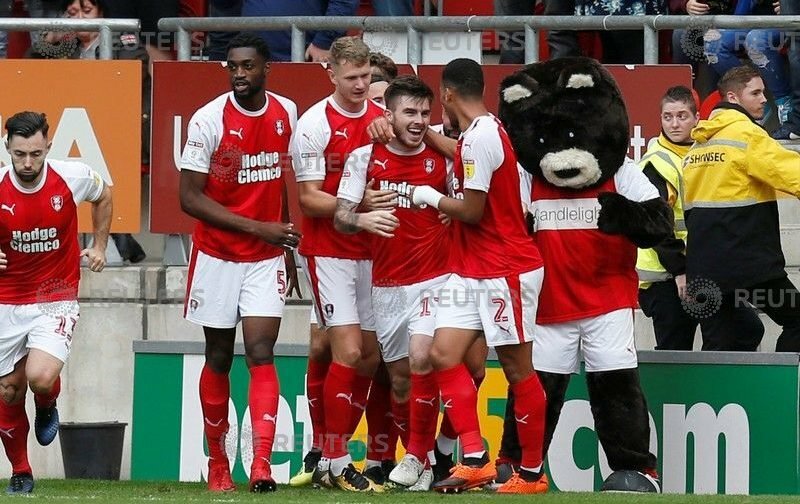 Both teams had chances, both ‘keepers had saves to make, there were red cards, yellow cards, a free-for-all and both sets of fans played their part with the Millers coming out on top with the only goal of the game coming from the penalty spot which Ryan Manning opened his Millers account with. The visitors started the game the better and in the opening minute Mason Mount tried his luck but it was an easy save for Millers ‘keeper Marek Rodak. Minutes later Rodak was in action again when he jumped above everyone else to claim the ball from a Martyn Waghorn free-kick. The Millers first chance came on five minutes when a long ball from Will Vaulks found Richie Towell, who was making his second debut for the hosts, who sent a good ball for Kyle Vassell but Derby ‘keeper Scott Carson got there first. Five minutes later a long goal kick from Rodak found Ryan Williams who in turn found Manning who saw his shot blocked but fall to Michael Smith but the Millers forward put the ball just wide. Rotherham forced a couple of corners which could probably have been better executed. Carson did well to get down to a Towell shot before some good work from Semi Ajayi stopped the Millers former loanee Tom Lawrence in his tracks getting the ball to Manning who clears. With twenty-seven minutes on the clock the Millers had Rodak to thank after Tom Huddlestone’s fiercely hit shot was acrobatically saved by the Millers ‘keeper. Carson again did well to keep out a shot from Manning before some super work from Towell saw him get into a good position to collect a good header from skipper Richard Wood only for Craig Forsyth to stick out a leg and put the ball behind for a corner which fell to Vaulks who put it wide. Vassell was causing Derby a problem every time he was on the ball and, not for the first time, he was hauled down by Richard Keogh, with the free-kick scrambled away for another corner. Minutes later the hosts won another corner which Manning again took and found Towell at the back post who let fly only for Carson to react well and put over the crossbar. In the final five minutes of the half Smith saw a shot go inches wide before some good work from Lawrence down the other end was equalled by Rodak who got the ball away to safety and minutes later Rodak had to fly off his line to stop a cross from Bradley Johnson reaching Lawrence. In time added on Lawrence and Vaulks had words on the touchline and referee Bankes spoke to them. Derby came out the quicker for the second half and a shot across goal from Craig Forsyth had Marek Rodak scrambling across his line. Richard Wood was the first to see yellow for pulling back Florian Jozefzoon with the following free-kick being headed way off target by Jozefzoon. With seven minutes of the half gone a superb cross from Zak Vyner found Joe Mattock who in turn found Kyle Vassell whose fierce shot looked to be going into the goal before a fantastic save from Scott Carson gave the Millers a corner which found Semi Ajayi’s head but he headed wide. On fifty-seven minutes a nasty challenge after the ball had gone on Richie Towell by Tom Lawrence ended in a twenty player melee. After calming things down Mr Bankes showed Lawrence a red card and a yellow for Martyn Waghorn and Vassell for their involvement. A minute later a frustrated Mason Mount was also shown a yellow card. A ball into the box saw Wood go to ground under a challenge from two Derby defenders and while the Rotherham players and fans appealed for a penalty the referee shook his head before going over to talk to his linesman and then pointed to the spot. As the Derby players surrounded the referee Ryan Manning picked up the ball and Richard Keogh was shown a yellow card. Placing the ball Manning looked up and put the ball into the bottom corner of the net to send eight thousand fans into raptures. A double substitution saw Mason Bennett replace Florian Jozefzoon and Martyn Waghorn make way for Jack Marriott for the Rams. Joe Mattock was the next to see yellow for a poor foul on Mason Bennett before the first sub for the Millers saw Jon Taylor on for Kyle Vassell and minutes later Derby’s last change saw Tom Huddlestone replaced by Duane Holmes. From a Manning corner the ball fell back to Ryan Williams who found the head of Michael Smith in the box but his header went wide. This was Smith’s last action as he was replaced by Jamie Proctor. A cross from Williams found Manning who saw his shot from just outside the box well saved again by Carson. At the other end a shot from Marriott went just over the crossbar followed by some trouble on the touchline when Derby Manager Frank Lampard said something to the linesman and was immediately sent to the stands by referee Bankes. Towell went down in a heap after he sliced a cross and after treatment tried to continue but was soon taken off in favour of Matty Palmer. After a foul on Vaulks, Johnson was the next player to receive a yellow card. Seven minutes of time added on and the Millers had to do some defending with Jayden Bogle having a couple of shots on goal. A poor challenge on Bogle saw Jon Taylor added to the names on the yellow card with a dangerous free-kick from inches outside the box being put just over the crossbar from Mount. As the game drew to a close some good work from Rodak saw him claim a cross from Marriott before it could find a Derby player. What a great spectacle from two Championship sides this afternoon and a good three points for the Millers sees them move to fourteenth.